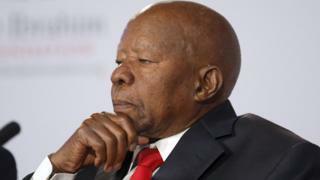 Botswana has declared three days of national mourning after the death of former President Sir Ketumile Masire, aged 91. Sir Ketumile, who led the country from 1980 to 1998, is credited with being the architect of the country's famed stability, reports the AFP news agency. He was also involved in peace initiatives across Africa, including ending Mozambique's long civil war. Botswana is one of Africa's richest and most stable countries. Sir Ketumile became president after the death of Botswana's first post-independence leader Sir Seretse Khama in 1980. He had served as the country's first minister of finance and vice-president before becoming president, the Botswana government states. Sir Ketumile stepped down in 1998 after overseeing a period of strong economic growth based on the effective management of the Botswana's vast diamond wealth. He was also involved in backing South Africa's anti-apartheid movement and other independence struggles in the region.